Machu Pichu probably can’t be beat for shear views alone but don’t forget that Peru is also home to Chan Chan, the largest and one of the oldest ruins in all of South America. Just east of Peru’s third-largest city, Trujillo, Chan Chan is easy to get to — no massive hikes to get to this ruin — and you can spend days wandering around the massive site where over 30,000 people once lived behind walls towering over 60 feet high. In fact, there’s plenty off-the-path sights to see all around Trujillo, as is discussed in this article. Just 20 minutes to the north is the sleepy beach town of Huanchaco, almost as famous for its savory ceviche as it is for being one of the continent’s best surfing spots. 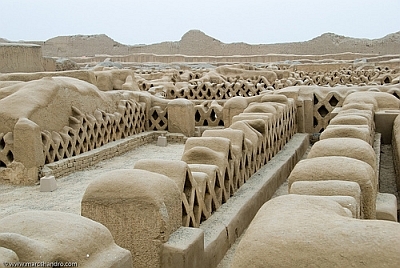 And all outside of Trujillo you can see plenty of remnants of the Moche civilization in the various Huacas — large ornamental monuments — built mostly for religious purposes and really quite a sight to see. Well, perhaps after a few days spent surfing.